Home » Website Building » SEO » How to Improve Readability of Articles for SEO? How to Improve Readability of Articles for SEO? Do you know that readability really affects the ranking of a webpage in search engines like Google? Well, gone are the days people read whatever someone publishes on the internet. Nowadays you can find millions of similar webpages for every search query. With this situation, you need to make your content stand out in the crowd by considering all aspects of SEO. Below is the content editor in WordPress with Yoast SEO plugin. This plugin is one of the top SEO options for WordPress users. It will add this meta box in the editor to make sure you are publishing articles with good readability. There are two important things in the readability – one is keyword you are focusing on and other is reading factor. Choosing the right keyword is a different task and you can get more details on that in this article. Considering readability, not everyone is using WordPress. Hence, you need to ensure the readability before even opening the editor on your website. Let us check how you can do that when writing the article. We give some examples from Microsoft Word as most of the authors use Word to create their documents. However, you can follow similar guidelines in any word processing software. There are very simple rules you can follow to make sure the content is in good for reading. Remember, English is not mother tongue of most of the people in this world. Therefore, your fluency does not matter on the article, what does matter is whether people can easily understand without looking for dictionary to search the meaning of the words you have used. Ensure to use simple and common words. 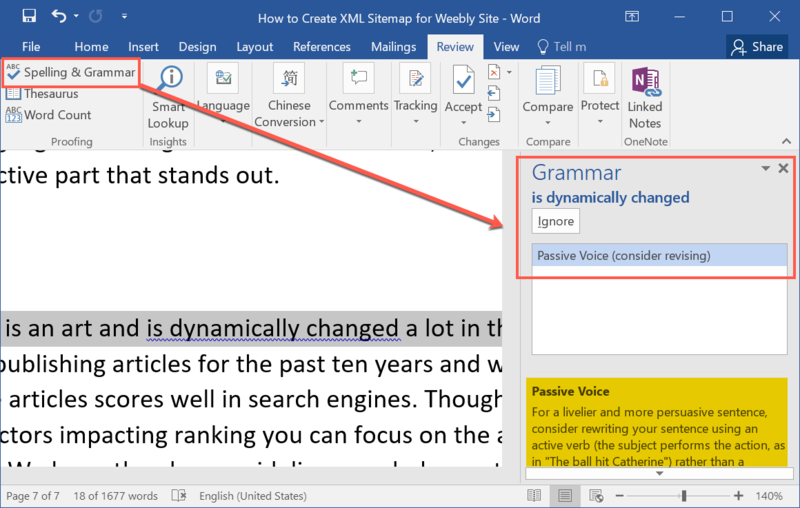 The latest Word versions will show you details of each mistake on your documents. For example, when you write “each and every”, Word will suggest you to change to “each” or “every”. After completing the article, go to “Review > Spelling & Grammar” option and check the content thoroughly. Related: How to create table of contents in Word? Always try to write in directly mode like how you speak to others. Instead of writing, “the article is published” in passive mode, write like “I published this article” in active mode. Again Word will show all the passive voices used in the document. You need to correct those sentences to direct active sentences. The good sentence length is up to 20 words to make sure the reader can focus on the sentence. Lengthy sentences like paragraphs will affect the concentration of the users. Similarly, breakup the paragraphs with few sentences not more than 300 words in total. Search engine and human needs to know the important portion on your article. You can use H1 to H6 headings to differentiate the introduction to conclusion parts with different levels. This will help to structure the content and add more value to each section. 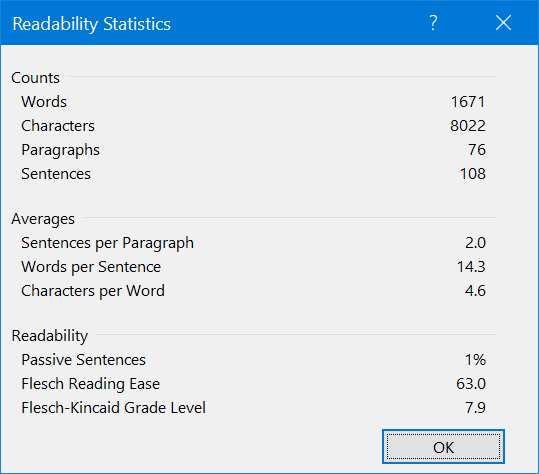 After you have written an article, you can check the readability statistics in Microsoft Word. First step is to do spelling and grammar check under “Review > Spelling & Grammar”. Once you have reviewed all the errors, you can get the confirmation prompt in Word showing the completion of the check. However, you can enable readability statistics to get more details. Related: How to compare two Excel spreadsheets? 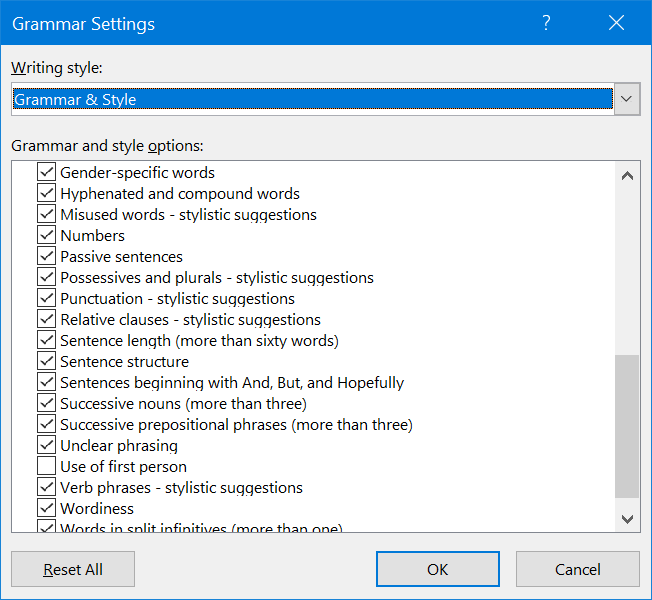 How to Enable Readability Statistics in Word? Navigate to “File” tab and open “Options”. 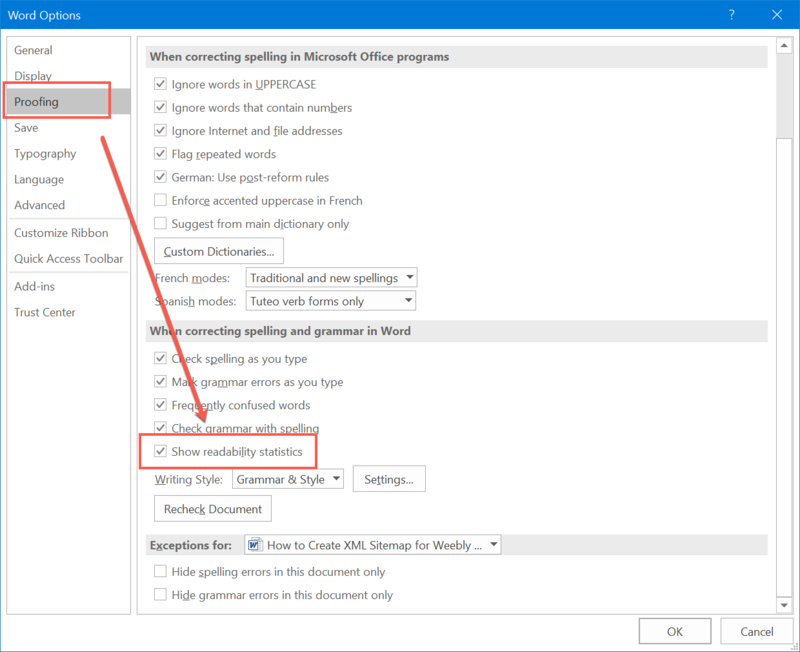 Click on “Proofing” section and look under “When correcting spelling and grammar in Word” section. Check the box that shows “Show readability statistics”. Click “OK’ to save your changes. You can also setup various options by clicking on “Settings” button against the “Writing Style:”. Ensure to select passive sentences and other important options to get more details during error check. Now click on “Spelling & Grammar” option under “Review” tab. Word will show if any mistakes on your document. After completion of the review, you can get the detailed readability statistics instead of a simple confirmation box. What Details You Get in Readability Statistics? It will show you the count of pages, words, sentences and characters. Though there is no limit for the content length, it is good practice to have at least 600 words so that readers can have good stuff on your page. 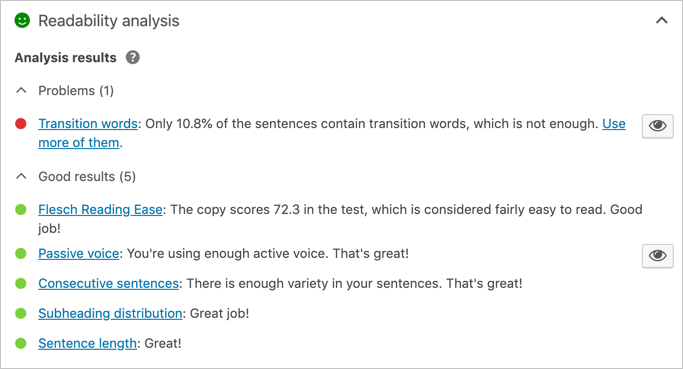 You can get average sentences per paragraph, words per sentence and characters per word. Ensure to keep the average sentence length with less than 20 words and not more than 10 sentences per paragraph. This section will show the percentage of passive sentences which you can try to make to 0. Also your content is considered as readable with the Flesch Reading Ease score of >60% and Flesch-Kincaid Grade Level of 7. It does not an end by having beautiful content that has great readability score. When publishing content online, you need to add the following stuffs to ensure users can get around your website. Add links to help users navigating in and out of your website. In SEO world, the pages without any link are dead pages. So ensure to have leading links to other popular pages on your site. You can also give references and link quality sites on your article. Give different color for links – this will help to have a visual identification of links. Use web safe fonts – use font size and family that suits your website layout and makes the content readable. Use call to action – when you have important content, ensure to put in the box and highlight with bright colors. In most cases, users will click on the attractive part that stands out. Content writing for web is an art and is dynamically changed a lot in the past few years. We are publishing articles for the past ten years and we can guarantee that readable articles scores well in search engines. Though there are many other factors impacting ranking you can focus on the area where you can improve. We hope the above guidelines can help you to writing useful content for your readers.